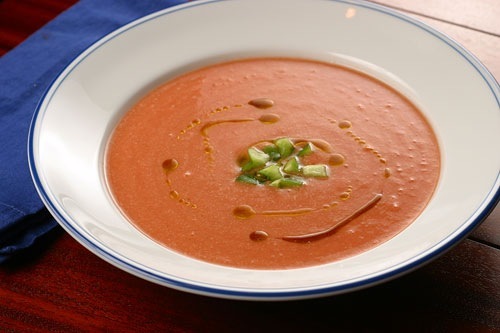 While studying abroad in Cordoba, Spain, I fell in love with gazpacho…a light tomato soup made simply with tomatoes, bread, olive oil, vinegar and garlic. 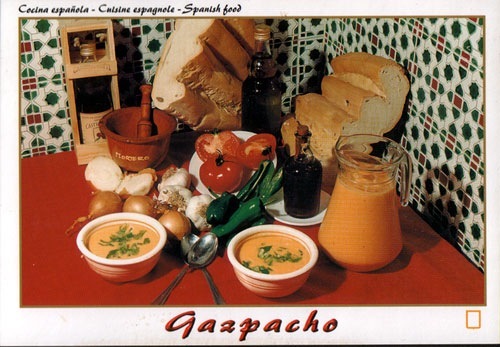 There are many different recipes for gazpacho out there; I got this one from a postcard I found at a little bodega in Spain. 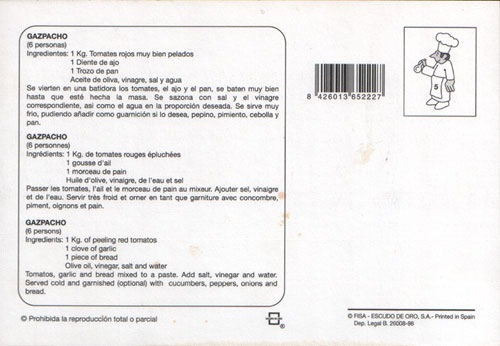 This recipe is the real deal…I remember Encarna, my house mother, making gazpacho using just these five ingredients. Legendary chef Jose Andres makes gazpacho by blending peppers and cucumbers into the mix. Well, I respectfully disagree…I like the peppers and cucumbers as garnish. I love Jose Andres and had the pleasure of meeting him once at his restaurant Zaytinya. He’s amazing! If you have not checked out his cooking show on PBS, Made in Spain, I highly recommend that you do. It’s part cooking and part Spanish adventure. Check out the TV schedule or visit the Web site. Anyway, back to the gazpacho. This dish is perfect for a hot summer evening–by itself or with other assorted tapas. We made this gazpacho with about 4 pounds of second tomatoes that we got from the farmers’ market. One time last summer when we made this dish, we got about 4 pounds of red and yellow tomatoes. With that many tomatoes, we had to make the gazpacho in 2 batches. So we did one batch of just the red tomatoes and the other of just the yellow ones. We served it in a flat soup bowl with the red gazpacho on one side and the yellow gazpacho on the other. It looked beautiful and tasted amazing! We didn’t get any photos, unfortunately, but we’ll try to replicate it again this summer and post photos. That tomato haul also led to the very delicious Heirloom Tomato Salsa. I can’t wait for tomato season to REALLY begin! 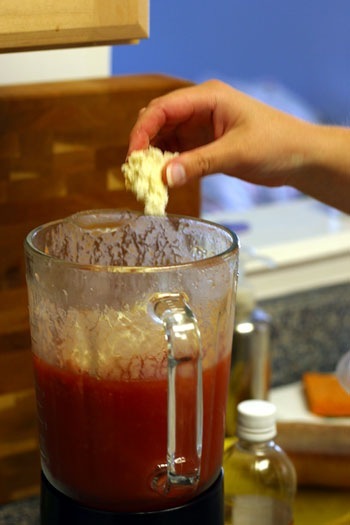 The recipe I use for gazpacho doesn’t have any measurements, so you’re going to have to eyeball it and do a lot of taste testing. Remove the skins from the tomatoes. 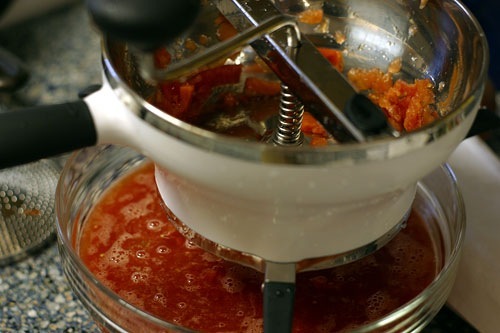 You can do this by either dropping the tomatoes in hot water for a few seconds and then using a pairing knife to remove the skins or you can chop the tomatoes and press them through a food mill, which will send the juices and seeds (depending on the size of the grate you use) through. Seeds are OK, the only part of the tomato that you don’t want are the skins and core (and any bruised parts, if you’re using second tomatoes). Blend until smooth. If it’s too liquidly, add a few more pieces of bread. The texture shouldn’t be to liquidly or too thick, and there shouldn’t be any visual or taste-able bread particles. Once the texture is good, add several pinches of salt, a decent amount of olive oil, and a proportional amount of vinegar (several splashes). Sherry vinegar from Spain is the best to use, but a few dashes of apple cider vinegar also helps to bring out the tomato flavor. Serve chilled with petite diced peppers (any color) and cucumbers. Once in Toledo I said, I wanna taste everyting. Gazpacho de Andalucia was in my way, first it taste funny but then I loved it. thanks for the recipes, I gonna tried it again. I moved with my family to Madrid back in 1960. to 1963. We had a cook by the name of Encarna that made the best gazspacho I’ve ever had. I make it all the time but love to find different versions…..Encarnas’ rules though, true Andalucian……..tapas forever! I LOVE gazpacho AND Zaytinya, for that matter! In Sevilla, I had a gazpacho that was very creamy and was served with smoked salmon. So delicious! Hi Nate, Good question! Seconds, might be term they only use at our market. Second tomatoes are the ones that get banged up, or are a little funky. You just cut out the bad part and you are good to go. Since you are just going to blend them all anyhow, it doesn’t matter too much how good they look. At $.69 a pound, they are tough to beat! Thanks for the book recommendation. I’ll have to check it out at the library. Hi Trish, Thanks for stopping by! Gazpacho is a great starter Spanish food. It is really tough to make a bad batch. Jose Andres has a great Tapas book. Not all of the recipes are easy, but they are all great. This looks great for a hot summer day when the apetite is leaning toward something light and cool. I found you on “FoodGawker” and am adding you to my bloglines line up. I am also going to look for a “beginners” book on Tapas. I think that sounds like a great solution for summer suppers – especially after working all day. This is the only time of year that I make gazpacho with tomatoes. Using winter tomatoes is not the same. I always garnish with some chopped cucumber, peppers and tomato, too.